First, you need to point to 3 registry hives: SAM, SYSTEM, and SECURITY. Usually, SYSKEY resides in your SYSTEM registry under HKLM\CurrentControlSet\Control\Lsa key. But once you set your SYSKEY for example to require a boot startup password and forgot it, there's no chance to boot up your system. Needless to say that SYSKEY is an extremely effective tool in the hands of a master. Setting your SYSKEY option to require a startup password or boot diskette is very effective against ANY(!) Windows password breaker. In that case, a password extractor program cannot decrypt your password hashes even if it gets a full access to your system. Note! SYSKEY resetting is an unsafe operation that affects the whole system security. For example, after SYSKEY is reset, even if you can logon your system, you will not be able to decrypt your EFS-protected files. There are a number of programs in the Net that proclaim they can reset SYSKEY. But none of them works correctly at the moment. The reason is that SYSKEY resetting requires a lot of additional operations for your system to prevent it from being broken. For example, you need also to zero out SAM domain session key(s), re-encrypt and reset local user hashes, LSA secrets, etc. 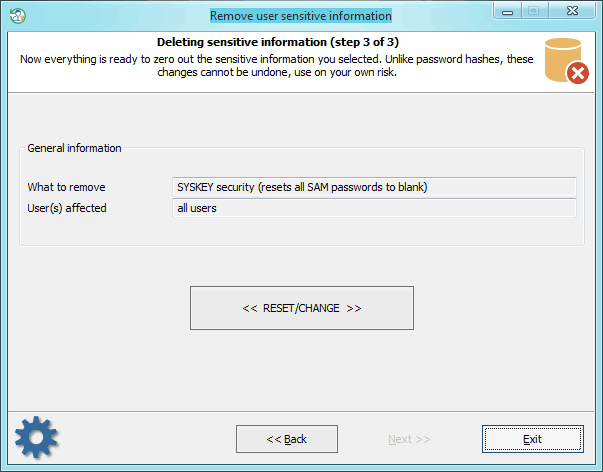 Reset Windows Password has 2 algorithms for resetting SYSKEY. Once the primary one fails, another one runs. After SYSKEY is reset, all local user passwords will be set to blank automatically. After resetting SYSKEY on a Windows 8 machine, you should change the password for every LiveID account to a non-empty one. Otherwise, you will not be able to logon the system with the empty password.